Arsenal have announced the signing of Malaga left-back Nacho Monreal for around £10m, subject to the completion of formal registration processes. Monreal has agreed a long-term deal, thought to be four and a half years. The 26-year-old has made 54 appearances for Malaga since joining from Osasuna in 2011 and won seven caps for Spain. "Monreal is an excellent ball-playing full-back with a solid all-round game both defensively and going forward, and at the age of 26 he's coming into his prime. "The only negative is that he'll be cup tied for the Champions' League but, for around £10m, it's an excellent long-term deal. "It is believed that Arsenal had been in talks with Malaga to sign Monreal in the summer, but the injury suffered by Kieran Gibbs during Wednesday's game against Liverpool brought the deal forward." Arsenal made their move after with a thigh strain sustained in with Liverpool. That left Andre Santos as their only recognised left-back. 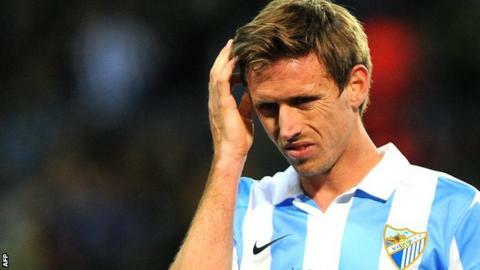 "We are delighted that Nacho Monreal has agreed to join us," said Arsenal manager Arsene Wenger. "We have been monitoring him for some time now and are really pleased that we've been able to agree this move today. "Monreal will add quality to our squad and of course, to our defensive unit. We all look forward to him playing for us." The 5ft 10in defender, Wenger's only signing in the January transfer window, is cup tied for this season's Champions League. Arsenal face Bayern Munich in the of Europe's elite club competition, at home on 19 February and away on 13 March. Monreal will link up with former team-mate Santi Cazorla, who for around £15m last summer.